Home / Workbenches & Jigs / True Cut Taper Jig Woodworking Plan. True Cut Taper Jig Woodworking Plan. 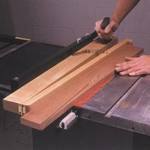 31-MD-00237 - True Cut Taper Jig Woodworking Plan. Ripping table legs or other project pieces at an angle can be frustrating and even dangerous work. However, with our taper jig, you will be able to quickly set the precise angle and safely cut leg after leg, with the first identical to the last. We used maple and walnut, but you can use a wood of your choice. A full materials and supplies list is included with the plan. Tablesaw, drill, bandsaw or handsaw, and clamps. A perfect project to display on a garage wall or in the driveway. A lot of people will do a double take when they pass by! A great project to display on a garage wall or in the driveway. A lot of people will do a double take when they pass by!